"I look back and think about what I ran in high school and what I'm running now, and it's just so ... I couldn't have dreamed of running what I am now. I don't even know if I fathomed it was possible." "I look at the times I ran and I kind of go, 'Wait, is that my best time?' It's pretty amazing." - Cam Levins talking about his meteoric rise that has resulted him running 13:18 and 27:27 in the span of 9 days, when coming into the year his PR was just 13:40. Alan Webb Vs. Robby Andrews & Curtis Beach at 800m on Sunday - Who You Got? CHRIS SOLINSKY, "Kenyans don't like to hurt from 1000m out.."
Big East men's 10K -- won in 33:06!!!?! The Samsung Diamond League Will Start Off With A Bang - 10 Spectacular Matchups Will Highlight Opener Next Weekend The Doha meet looks to be spectacular. We always say one of the biggest problems with track and field is the stars never race each other but they sure are early this year. Where to begin? What is better? David Rudisha vs. Mohammed Aman, Asbel Kiprop vs. Abubaker Kaki, Kenenisa Bekele vs. Augustine Choge, Pamela Jelimo vs. Janeth Jepkosgei, Meseret Defar vs. Vivian Cheruiyot, or Asafa Powell vs. Justin Gatlin? Jamaican International Meet: Usain Bolt (100) And Yohan Blake (200) Highlight; Asafa Powell Still A Question Mark Bolt up against Lerone Clarke, Michael Frater and others (possibly Powell). Shelly-Ann Fraser Pryce, Carmelita Jeter, Bianca Knight and Kerron Stewart highlight the women's sprints. *Asafa Powell Is Injured Again (Groin) & Pulls Out He's still planning on racing in Doha next weekend. *Caribbean And North American Audiences Can Watch For Free Online You can watch here. Kenyan Prison Champs: Kiprop & All 1,500 Runners Watch Out: Silas Kiplagat Runs 1:44.8 In Kenya The IAAFand tilastapaja didn't even list an 800 PR for the guy. Day 1: Silas Kiplagat Runs Fastest 800m Of Day (1:47.1) In Pouring Rain Isaac Korir won the 10k (28:25) over Africa XC champ John Mwangangi. 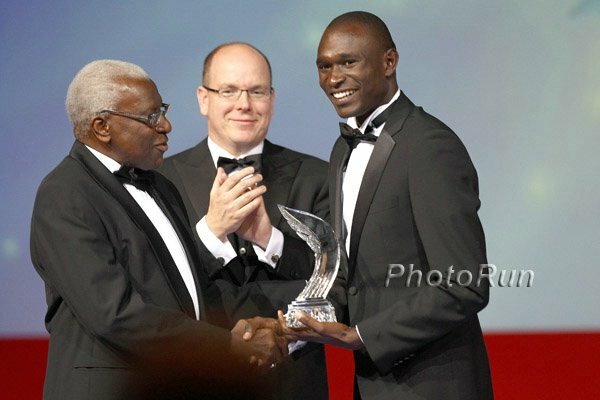 *The Usually Cocky Silas Kiplagat Taking On A More Humble Tone "I cannot say that I'm the best, I'm not the best, there are emerging athletes." Berlin Sunday: No Wonder The Sport Isn't Popular: RAS Al Kahimah & Berlin Half Winner Now Has New Name - Dennis Kimetto - And He Wants 25km World Record The guy who was formerly known as Dennis Koech and who went from age 18 to 25 in 2.5 now months now claims he had the wrong name as well. He has finally been entered with his correct name. *Dennis Kimetto To Go For 25k WR At BIG 25 Berlin He ran a 59:14 half marathon one month ago. Japan Sunday: Nice Pro Japanese Grand Prix With Brimin Kipruto, Allyson Felix, & Liu Xiang Is Sunday A great steeple with Olympic champ Brimin Kipruto, two-time WJ Champ Jonathan Ndiku and Roba Gari (5th WC) should be one of the highlights. *Simon Magakwe Hoping To Be The First South African Under 10 Seconds He's currently tied for the NR (set in 1988) with 10.06. IAAF Preview Of Desenzano del Garda Multi Event Challenge 2004 Olympic bronze medallist Kelly Sotherton returns to the heptathlon after leaving to focus on 400. Do You Want To Go To Monaco To See A Samsung Diamong League Event & Usain Bolt? Well Then Enter The IAAF "Strike The Bolt" Contest All you have to do is take a picture or video of yourself in the "strike the bolt" pose and send it in to the IAAF's facebook page. Bolt himself will pick the winner. Greg Rutherford Equals Britih LJ Record (8.35) At US Olympic Training Facility In San Diego Yes, the US seemingly is helping one of Britian's finest. Rutherford Reveals How Watching Carl Lewis' Takeoff Led Him To Equal British Record A little help from US citizen but British coach Dan Pfaff (who is a super coach in LRC's opinion) didn't hurt either. Olympic Stadium: British University Champs Are Being Held In Olympic Stadium This Weekend - Some Top Pros Will Be There As Well There are 150 British Olympic hopefuls also competing alongside. *Seb Coe Says Olympic Stadium Was Specially Designed To Decrease Wind It has been dug about six meters down from the ground level so it's more sheltered. 4 Women In Ireland With Marathon "A" Standard Urge Athletics Ireland To Pick Olympic Team Prior To Original June 12th Date & They Say They Will Probably shortly after May 20th when the last hopeful runs a spring marathon. Thursday: Kenya Prisons Champs: Silas Kiplagat And Nixon Chepseba In The 1,500 Catherine Ndereba in the 10k. Patrick Makau Claims He Went To London Knowing He Was Going To Drop Out Says he was already promised an Olympic spot. Paul Tergat supports him and says Kenyans have been racing too much lately compared to Ethiopians. *Makau: "I sacrificed a lot of races since last year for the sake of Olympics, but all that is now down the drain." Andrew Wheating To Open Season Saturday At Oregon Twilight In Either 800 Or 1,500 Sally Kipyego may be in the 1,500 and UO coaches are also excited about running back De'Anthony Thomas (10.57/20.61 in high school) anchoring the 4 x 1. RW Q&A With Dathan Ritzenhein He'll chase the "A" standard for 10k at Hengelo, Netherlands on May 27th and for 5k at Pre. Runners Tribe Interview With Coach Of Marathoner Jeff Hunt Another one who has the Olympic "A" but may not get to go due to Aussie stricter standards. Team Honoring Late Penn State PVer Will Try To Break 1,000 Mile Relay WR Ten man team includes Ryan Foster and each runner will have to do 5 miles at a time averaging 5:57 pace over the 4 day trip. 4 Irish Olympic Marathon Hopefuls Beg Athletics Ireland For A Quick Decision All four are friends/training partners. AI won't choose until June 12th, but that is ridiculous as it doesn't let them plan their training or chase a track standard if they're left off. Tragic London Marathoner Claire Squires Buried Next To Her Brother She had a heart condition. Pro News: Nice Profile: Sprint, Long Jump Star Ngoni Makusha Was Discovered In Zimbabwe By A Coach's Mom At A Track Meet He has signed with Li-Ning and is still training in Florida. *Paula Radcliffe Still Optimistic About London Olympics She's the only runner getting in the Daily Mail. College: Florida Men, Texas Women New #1s In Collegiate Ranks Oregon women now #7. Another Epic Steeple Fail It's pretty good. Breaking News: Andrew Wheating Assaulted In Philadelphia! Not really, but if you've got 30 seconds to watch a video, you'll be entertained. Alan Webb In San Jose Paper: "I almost try not to compare myself to what I did in the past...I know that it's there. I know I can still do it." Schumacher On Lopez Lomong's 5k Prospects Months Ago "He's really developing, and proving that his strength can be a major asset for him as well He may develop into a really nice 5,000 runner." Brits Celebrate Some Fine Performances At Stanford, Led By Julia Bleasdale's Mind-Boggling 2:51 PR The 30-year-old Bleasdale went from 34:20.77 to 31:29.57 in one race. Also Chris Thompson ran 13:15.21, immediately ahead of Thomas Farrell, who set a new UK under-23 record of 13:15.31. New Buffs Steeple Star Shalaya Kipp: "That was actually a lot of fun, yeah." MB: *Hasay dejected, realizes she's not making Olympic team this year *Is this the first time a Canadian distance record>U.S. distance record? Recommended Read Meet 72-Year-Old USC Coach Ron Alice, Who Tries To Move On After Losing His Wife To Cancer "He talks about how the house is just so empty. That was it: Sharlene and coaching. That is his life. He loves to coach. He loves to win. Out on the field he's in his element. He bleeds track, it's in his veins, his DNA." Still Coaching Into His 70s, Santa Monica Track Club's Joe Douglas Is Doing What He Always Does, But Team Is On Verge of Bankruptcy Prince Mumba: "He's very encouraging and motivates us, but he's a very tough coach." Sheryl Crow Breaks 2:00!!! 2 hours in the half marathon, that is. Ardent Anti-Doper Hannah England: "Athletics is all I think of - it's like being in love." Guys, you actually are out of luck as she's married to Luke Gunn. 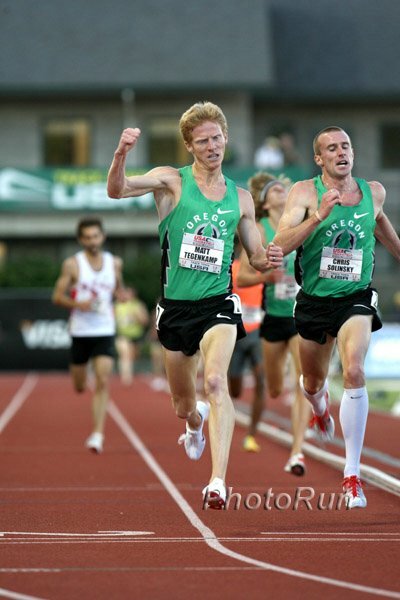 LRC Men's Recap: One Of The Most Exciting Men's 5,000s We've Ever Seen; Alan Webb Doubles; And Chris Derrick And Cam Levins Battle It Out With Sam Chalanga What a men's meet!! 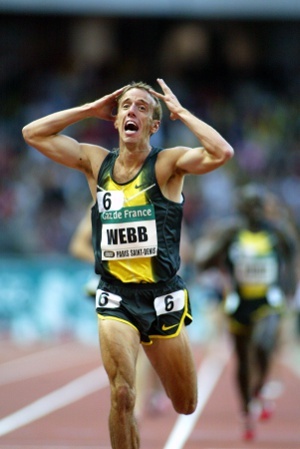 !Alan Webb finished third-to-last in the 1,500 but by the end of the night his fans were absolutely thrilled by his progress. 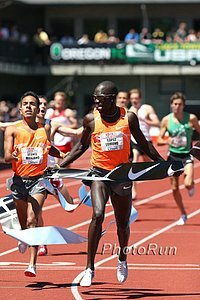 The 10,000 matchup between the collegiate record holder Sam Chelanga and the two collegians who have recently beaten the seemingly unbeatable Lawi Lalang lived up to the hype, as Chelanga, Chris Derrick and Cam Levins battled it out for victory over the final 400. But the men's 5,000 may have stole the evening as it was one of the most exciting and fun races we've ever watched. Click here to watch it without having the results spoiled for you. LRC Nick Symmonds Runs 1:44.0, Leo Manzano Outkicks Bernard Lagat To Highlight 2012 Penn Relays Distance Action Nick Symmonds soloed a 1:44.0 800m in impressive fashion to run away from Khadevis Robinson, who opened his 2012 season with a 1:44.9 in the DMR. All that did was give Bernard Lagat a big lead which he coughed up to Leo Manzano. Plus, Oregon, Princeton and Penn State (with Robby Creese on the anchor) all get their second Penn titles of 2012. *Madison, Felix, Knight, & Jeter Go 42.19 @ Penn! Lagat: "I felt that my legs were a bit heavy." *Nick Symmonds: "I said if I'm going to come all the way here, I might as well throw one down" + Oregon's Anne Kesselring Gets Performer of Meet Post-race interview with Nick here. Düsseldorf Marathon Recap: Agnes Jeruto Barsosio Debuts In 2:25:49 Seboka Tola ran 2:08:27 to win the men's race. RR: Andrew Wheating Talks About His Comeback, Making The '08 Games, And Looking Ahead To The Trials On his and Russell Brown's comedy sketches, he said: "I'm a goofball. Jim Carrey is without a doubt one of my biggest idols ... A lot of people don't know that Russ and I are really weird people." Good Interview: Ryan Hall Has Good News, He's Training At Altitude Again Says his plantar fascitis is getting better and talks about how he and Sara share a pacer who paces him on the bike and her in track workouts. Kenyan Olympic Marathon Team Announced: Makau AND Mutai Left Off The Kenyan Olympic Marathon team was announced (video here) and the AP is making a big deal of the World Record holder Patrick Makau being left off. The big news in our minds is the world's best marathoner in 2011, Geoffrey Mutai, being left off in favor of Mosop Mosop (and Abel Kirui). 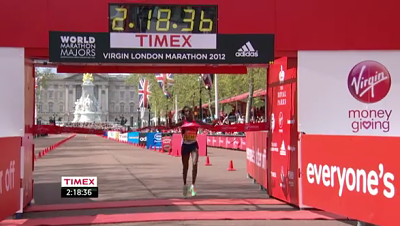 The women's team was the top 3 in London, although Employee #1 was surprised Boston Champ Sharon Cherop was left off. LRC Mary Keitany Runs Fastest Final 10km In Marathon History To Repeat & Become The #3 Performer In History The Kenyans certainly came to play when it was time to battle it out for the title and London Olympic spots, as they went 1-2-3-4-5, but in the end, everyone was left talking to about Keitany, who used a 5:07 23rd mile and 4:59 24th mile to pull away from world champion Edna Kiplagat and mark herself as the Olympic favorite. LRC Meet Mary Keitany Employee #1 met her in her home in Kenya. LRC Meet Mary Keitany The half marathon world record holder destroyed the best women's field in the world last year in London. Then on the hilly New York course, she went out faster than Paula Radcliffe during her world record before falling apart miserably. Now she has to qualify for the Olympics in London. Get to know Mary Keitany. LRC Meet Wilson Kipsang: "If I had to compare him to an NFL quarterback, I'd compare him to Peyton Manning." 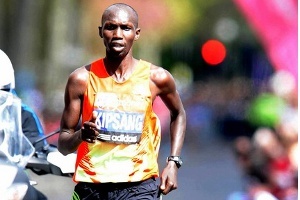 link fixed We share with you this unpublished segment on Wilson Kipsang from Employee #1's final piece in the 8 Days of Glory Series. 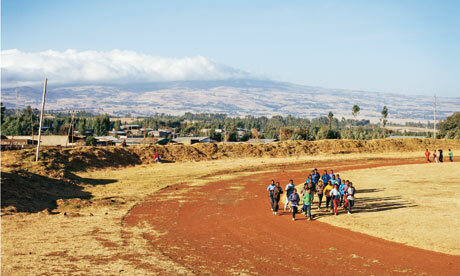 Short segment with video interview with Kipsang overlooking the Rift Valley. 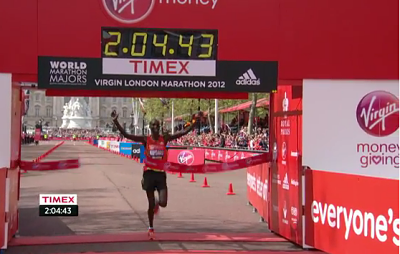 LRC The Electrifying Abel Kirui The two-time World Champion has dominated non-rabbited races. Can he do the same in London on Sunday? Learn about his training and his set-up in Iten as he talks about phantom planets and more - from Employee #1's trip to Kenya. Worth A Read: The Cool Story Of How Scott Overall Made The British Olympic Marathon Team A year ago he was selling shoes and about to quit the sport. Now he's an Olympic marathoner. Recommended: Excellent Post By Science Of Sport On Boston Conditions: The Surge Between 25 And 30k And The Sun Did The Leaders In We'll have more LRC analysis but this post does an excellent job of explaining what happened. Also read this post that explains why telling people to over-prepare for the heat may not be the best idea. And only 427 people deferred to next year's race. RRW: Wesley Korir Comes From Behind For Shock Victory Korir, the former University of Louisville, Ron Mann-coached athlete was 57 seconds behind the leaders with less than five miles to go. Then the heat took its toll on leader Levy Matebo and Korir stormed to victory in 2:12:40 as American Jason Hartmann used a similar tactic to get 4th in 2:14:31. The winner was nearly 10 minutes slower than last year. Crazy. 17-Year-Old High Schooler Cayla Hatton Runs 33:17 10,000m Olympic Trials "B" Qualifier The prodigy only started running full-time this year. Now she's putting up a time that would make her 5th in the NCAAs last year. Truly ridiculous. The time is so fast some were wondering if it was a lap short, but this video proves it's legit and shows she ran every lap (16:30-16:46). *A Q&A With HS Prodigy Cayla Hatton Two years ago, she was in awe of Kara Goucher and asking for her autograph. Now she'll be racing against people like her at USAs in the 10k. RR: 50 stunning Olympic moments No 27: Ann Packer wins 800m in 1964 "Packer won gold in Tokyo having never previously run an international 800m race, and with the final itself only her eighth ever two-lap run." Not only that - she set a new world record of 2:01.1. Very impressive stuff (she had opened a 2:11 in her 1st 800 in May that year). What's Next For Lopez Lomong? At This Point, His Coach Doesn't Know "Lopez has a lot of possible events," Schumacher said. "He's truly an athlete who could run anything from the 800 to the 10,000 and be successful." Lomong proved that at Stanford with an unforgettable performance. "I've seen people misjudge the '5' before, but I've never seen anything like that. He ran such an explosive lap, and then was able to get back out there and do it again. Wired: Study Reveals Joggers Live 5 Years Longer 20 minutes, 3 times a week is enough. What Do You Do To Help The Sport? Former Olympian Alan Culpepper And Wife Shayne Are Volunteering To Help More 200 Children From Kindergarten To 5th Grade Learn To Run "The goal for this is not to identify future Olympians. It's to create a habit that they can maybe take through life ... hopefully changing their perception of what exercise is and that it doesn't have to be torture and it doesn't have to be punishment or only about weight management. It can be just to do it." For Everyone Who Thinks Every Young Death Is The Result Of PED Use: NY Times: Should Young Athletes Be Screened For Heart Risk? Alan Webb To Race Robby Andrews & Curtis Beach At 800m On Sunday After seeing a 3:39/13:49 double last week, Alan Webb fans won't have to wait long to see if his stunning improvement continues as he'll race an 800 this Sunday at Duke. *MB: Is Webb racing too much? *MB: German Fernandez is coming back, now 3:43 He beat Riley Masters in the process. *MB: Big East men's 10K -- won in 33:06!!!?! *Oregon's Brianne Theisen Ahead Of This Weekend's PAC-12 Heptathlon Champs: "I'm nervous as hell, to be honest." She needs the "A" standard to make Canada's team. 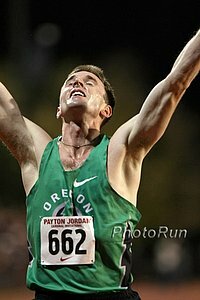 Chris Solinsky Will Not Enter The 2012 US Olympic Trials "I tore 90% of my hamstring off my pelvis. I'm going to have to bag it this year and swallow the hard pill that it's not going to happen. It's a matter of my body not responding." *Quick Interview From Before Announcement He also talks about how if he bumps into the rival Oregon Project guys on a run, they'll run together. LRC Diego Estrada Would Have Been Eligible To Run Olympic Trials Diego Estrada, the recent American citizen and NAU redshirt junior, ran the second-fastest time ever by an American collegian at 10,000m on Sunday. Afterwards, he declared he'd be running at the Olympics for Mexico. One of the reasons he cited for his decision was that he wasn't eligible to run the US Olympic Trials. Turns out that was incorrect, as Diego was given erroneous information. 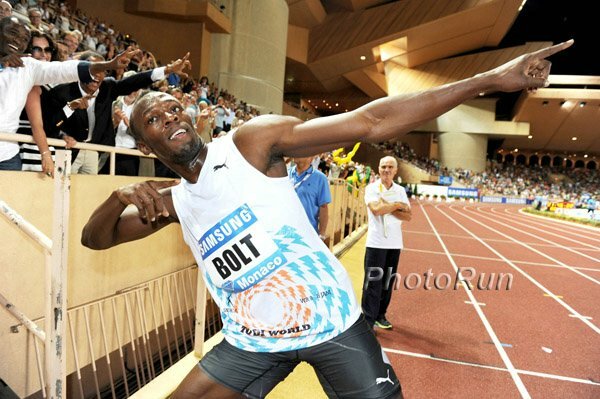 Rome Diamond League Start Lists Released Usain Bolt, Asafa Powell and Christophe Lemaitre in the 100. Vivian Cheruiyot up against Meseret Defar and double world silver medalist Sylvia Kibet in the 5k. In the 800, Caster Semenya, Daegu Champ Maria Savinova, Olympic/World Indoor champ Pamela Jelimo and Janet Jepkosgei. Dai Greene vs. "Batman" Jackson in the 400H. Pre Classic: Pre 5k Gets Even Better With World Indoor 3k Silver Medallist Augustine Choge The 12:53 man joins the already stacked field. May 12th: Bobby Curtis, Leonard Korir And Ben St. Lawrence Added To UAE Healthy Kidney 10k Previously announced was the 2012 U.S. Men's Olympic marathon team in Meb Keflezighi, Ryan Hall and Abdi Abdirahman. 10 Reasons To Watch The Hammer In 2012 A great preview of what to watch out for in the hammer this year, including a chance for a US Olympic medal. NBC Olympic Streaming Might Have A Catch You have to prove that you have a pay-TV subscription. No subscription, no free live streaming. You Know Track Is A Tough Profession When...Olympic Champ Bryan Clay Talks About How Nike Dropped Him Last Year And How He Wants To Prove Doubters Wrong In 2012 He's now with Asics. Portuguese Distance Runner First Caught Using The Athlete Biological Passport Olympic 5ker/marathoner Hélder Ornelas gets a 4-year ban. LaShawn Merritt Runs His First 400 Of The Season With A World-Leading 44.73 At The Great Caribbean International Meet Dayron Robles opened his season with a 13.19 to win the 110 hurdles. Asafa Powell Likely To Miss This Weekend's 200 Against Yohan Blake Due To Groin Injury Article mentions he could possibly switch to the 100 and race Bolt, but that's doubtful. 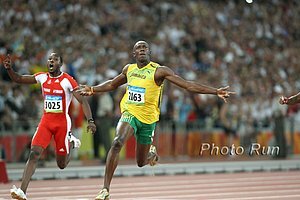 *Humorous Article On Bolt Trying To Break The "100m Immigration Line WR At Heathrow Airport"
4 World Champions Added To Fields At NYC Diamond League Meet (June 9) Jason Richardson, Jesse Williams, Aries Merritt and Sanya Richards-Ross join previously-announced Yohan Blake, Carmelita Jeter, David Rudisha and David Oliver. Ajee Wilson Hoping To Be First To Break 2 In High School 800 The high school record is 2:00.07 by Kim Gallagher. Gallagher in her short life went on to win two Olympic medals (more on Gallagher here). If Ajee goes sub-2:00, hopefully it's at the Olympic Trials and she makes the final. Jordan Hasay To Focus On The NCAA Season As She Realizes She Has A Long Way To Go To Compete With The Best In The World Message board discussion here. Brimin Kipruto Hoping To Become 1st Man To Defend Steeple Crown "Running is my office and I have to take it very seriously. I'm training twice a day, in the morning and evening and sometimes, I train three times a day." British Miler Series Debuts This is a TV series in Britain but also online the The Telegraph is following some of Britain's Olympic mile hopefuls. First it looks back at the distinguished honor roll of British middle-distance runners. Science Of Sport Weighs In On Lifetime Bans "The science simply cannot guarantee with 100% certainty that an athlete who fails a doping test is actually doping." It Takes One To Know One: Justin Gatlin: "Chambers deserves to be at Olympics." Phil Hersh Happy That Holier-Than-Thou Brits Have Drug Ban Overturned "Who is naive enough to think Christie was indubitably clean when he won the 1992 gold?" USADA: Life ban overrule only fair "The authority of WADA has been recognised ... and it is a good day for those who believe in the ability of WADA to put in rules to protect, in a fair manner, the rights of clean athletes on a level playing field. ... When you set the rules and the world agrees to those rules, that is what all athletes rely on. It would be an unlevel playing field for one entity, or one organisation, to attempt to change those rules." 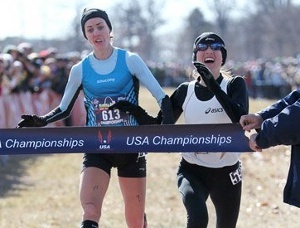 LRC Women's Recap: Anna Pierce Is Back!!! Betsy Saina And Sally Kipyego Impress As Deena Kastor Returns Impressively But Comes Up Short Where to begin? Anna Pierce returned to relevance with a fantastic final 200 to win the women's 1,500 as Deena Kastor impressive returned to the track but came up a little bit short. Sally Kipyego showed that she's way, way better than your average Olympian. Plus another Colorado steeple star? And strong runner-up showings by Amy Hastings and Julia Lucas. Dwain Chambers Goes From Pariah To Mentor As Opinions Turn When Dwain Chambers challenged his Olympic ban in 2008, he was openly scorned, now he will be openly welcomed back. Drake: Wallace Spearmon's 20.02 Breaks Michael Johnson's Meet Record At Drake Spearmon has been running great this year. It was so cold at Drake that Lolo Jones didn't run, yet Spearmon ran 20.02. Jenny Simpson won the 1500m in 4:12.95 over Maggie Infield. Oregon Women Dominate 4 X 1,500 Without Jordan Hasay At Penn Hard to believe this was the Duck women's first win at Penn. 53.8 Last Lap Gets Princeton DMR Victory updated The men's DMR was a sit-and-kick affair as every team but 3 was in it until the final kick. Princeton's Donn Cabral showed his new speed and unleashed a 53.8 final lap to get the win over Indiana's Andy Bayer in the slowest winning time since 1973. Princeton won the 4 x mile last year and will get a chance to defend tomorrow. High School: Edward Cheserek went out in 57 on the first lap of the 400 to lead his team to DMR victory. *Sheila Reid Finally Gets A Penn Relays Title As Villanova Wins DMR Reid got the baton even with Tennessee and ran 4:40.8 to give Villanova the win in 11:01.03 (1,200 - 3:22.9, 400 - 52.9, 800 - 2:04.5). She actually didn't have the fastest leg, though, as Princeton's Greta Feldman (4:38.7) and BC's Caroline King (4:39.2) were faster. *Penn Relays Thursday Prep Recap Mary Cain won the mile with a US-leading 4:39.28. Haley Pierce anchored in 4:42.9 to give Tatnall High the win in the DMR with a MR 11:28.86. Sophie Chase won girls 3k in 9:37.86. *If It's Too Cold, Lolo Jones Could Scratch From Drake Relays "Oh, 45's definitely 'no way.' Even 50 is kind of, 'uhhh.'" 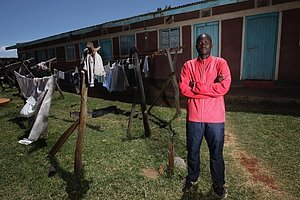 LRC A New #1: Wilson Kipsang Destroys One Of Greatest Marathon Fields In History In his first marathon major, Kipsang certainly wasn't scared of the bright lights, as he did something unheard of in major marathoning in the year 2012. He took off before halfway and used a 14:09 fifth 5km to obliterate the lead pack, as a 1:02:12 halfway wasn't fast enough for him, and he went to earn the largest margin of victory in 30 years, while Martin Lel was second. We recap it and speculate as to who gets the Kenyan Olympic spots and tell you why a DNF in our minds is a positive for someone's Olympic hopes. LRC Meet Wilson Kipsang: "If I had to compare him to an NFL quarterback, I'd compare him to Peyton Manning." Sharon Cherop Outkicks Jemima Sumgong Cherop was third last year and third at the World Championships but she got the huge win here as she outdueled countrywoman Jemima Sumgong. Believe it or not, this was the 5th straight year the women's race has been decided by 3 seconds or less. *40-Year-Old First American Sheri Piers Is From Maine But Was Ready For Heat Thanks To Training On A Treadmill Text and interview. Great Read If You Didn't Read It Yesterday: Alberto Salazar Unplugged - Part II This interview with Amby Burfoot is great. From Ritz's struggle in the marathon, to Ritz's form change, to Alberto's competitive relationship with Jerry Schumacher, to Galen Rupp's marathon future and, to Alberto's biggest regrets, Amby Burfoot leaves no question unasked and Alberto doesn't shy away from any of them and talks about Rupp running 12:45 and in the 26:20s. *Part I: Alberto's Book & The "Duel In The Sun"
LRC Ryan Hall Feature Film In The Works A full length film on Ryan Hall's quest for glory in London 2012 is in the works. Learn more about the film "41 Days," watch a trailer, and learn how you can help support the film and get some Ryan Hall memorabilia. Image below. LRC Carey Pinkowski Reflects On Khalid Khannouchi's Career: "He Was The Absolute Best I've Ever Seen" The Chicago marathon director talks about the man who made his name in the Windy City. Plus quotes from London Marathon director Dave Bedford and a tweet from Ryan Hall. LRC Marathon Legend Khalid Khannouchi Officially Retires Khalid Khannouchi, one of the greatest marathoners of all time, has told LRC that he is officially retiring from competitive running. 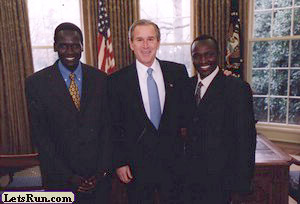 Khalid helped revolutionize the sport of marathon running, setting two world record in the span of three years, including his final one at the "Greatest Marathon Ever Run" - the 2002 London Marathon matchup that featured Khannouchi, Paul Tergat and Haile Gebrselassie. Shalane Flanagan Wins Lisbon Half, Tadese Three-Peats Updated with IAAF story The American got the big upset win (just as we predicted) and Zersenay Tadese got the win but not the world record (just as we predicted - a broken clock is accurate twice a day). Flanagan ran 68:51 for the win. OTB: Flanagan wins Lisbon. Lock for Olympic gold? *Will there be an official Lisbon half-marathon thread? *Letsrun...seriously your picking Shalane Flanagan to win the 2012 Lisbon Half Marathon? 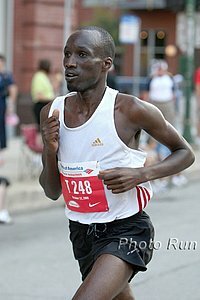 LRC WTW: Is Lopez Lomong A Medal Contender Gold Medal Contender? Is Matt Tegenkamp Still Relevant? Are Alan Webb And Anna Pierce Back? Plus Boston, London And The Return Of Bekele So much has happened the last few weeks, we haven't been able to stay on top of it all. We've been so busy trying to cover one big event and preview the next big event that we haven't had time to do our weekly recap. 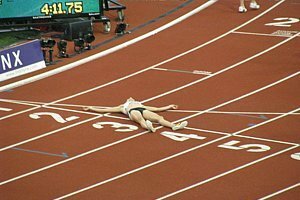 But no worries - we get everyone caught up on the last three weeks with a monumental week in review that includes five thoughts about 2012 Stanford, five thoughts about the 2012 Boston Marathon, and five thoughts about the 2012 Virgin London marathon. Along the way, we hype Lopez Lomong as a gold medal favorite, try to make sense of Kenenisa Bekele's return and wonder if Matt Tegenkamp is still relevant anymore. Video: The British Miler, Episode Two On Andy Baddeley, who hit the "A" standard with 3:35.5 at Payton Jordan despite having a heart condition. China: Sammy Wanjiru II? Ayele Abshero Follows Up His 2:04:23 Debut Marathon With A 1:01:11 Half Marathon Win In China Ethiopian Ayele Abshero grabbed the win in the men's contest of this IAAF Silver Label Road Race in a 1:01:11 season's best. The 2009 World Cross-Country champion, who has run a 2:04:23 Marathon this year winning in Dubai, has a personal best of 59:42 from last season. Düsseldorf: Ethiopia's Seboka Diriba Tola (2:08:27), Agnes Jeruto (2:25:49) Break Course Records *LetsRun.com's Hero Yuki Kawauchi Is 8th In 2:12:58 The full-time worker didn't have too much time to think about the results as he had to get back to his job: "I'm going straight from the airport to work." Someone needs to tell the guy to take a break. Lengthy Look At Usain Bolt And His Entourage Telegraph Bolt says he drinks Guinness and "Once a year I will clean my room, just because I feel I should." *Usain Bolt Only Worth $6 Million? This can't be right. He's got to make more than that per year. RIP: LeRoy Walker Pioneering 1996 USOC President, 1976 US Olympic Track Coach Dies Dr. Walker, the grandson of slaves, was born in the segregated South yet rose to the top of the US Olympic ranks. NY Times obituary. Ryan Hall Running ING NYC Marathon Hall and Kiwi Kim Smith were announced for this year's race at this year's Opening Day presented by Asics, which featured a live ABC7 broadcast (full replay here) and even the "Ridiculously Photogenic Guy." It will be Hall's second New York City Marathon. Update: Where Has Andrew Wheating Been? Most interviews are completely pointless. "Tell us about your race ..." This one is very different. You might not want to watch even the full 6 minutes. We did. *MB: Wheating interview on injury, completely serious ! What are your best bang-for-the-buck running tips? 1) Nike Free 2+ $59.98 For men - 1 color only at this price. Other colors and women $79.99-$99.99. Little LRC gets a commission with your purchase.